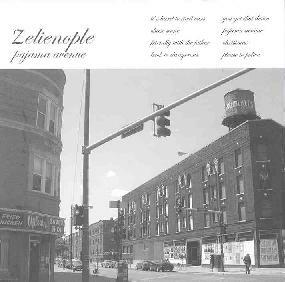 Chicago’s Zelienople is the kind of band you expect to hear in dimly lit, smoky clubs, late at night, after the ruckus crowd has retired. Their music is a hazy, flickering soundtrack to being lost in one’s own thoughts. Blending mellow jazz with a little shoegazer and even a little psychedelia, their sound is stripped down and laidback. Bassist Matt Christensen’s almost whispered vocals are both wistful and sleepy, and fit in perfectly with Mike Weis’ superbly understated drumming and Brian Harding’s sparse, swirling, droning keyboard textures and mournful clarinet. A minor downside I found to the album was that the songs have a tendency to not vary much in pacing or mood. That’s not necessarily a bad thing; it makes for a consistent overall sound, which works well when you just want a contemplative setting for your thoughts, rather than a distraction from them. But with the interesting combination of instruments, it would be nice to hear Zelienople explore a little more, maybe broadening their scope into some extended pieces. Perhaps that will come on a future release. For now, Pajama Avenue still has something interesting to offer, from a new band in pursuit of new sounds and new ideas. For more information you can visit the Zelienople web site at: http://www.zelienoplemusic.com. Contact via snail mail c/o Loose Thread Recordings; PO Box 220180; Chicago, IL 60622.